1. Preheat the oven to 200°C, gas mark 6. Place the salmon on a baking tray and bake for 20 minutes. 2. Meanwhile, cook the quinoa/bulgar mix for 12 minutes in boiling water, adding the broccoli halfway through, then drain. 3. 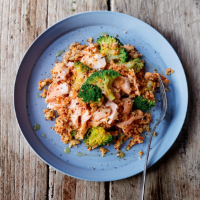 Break the cooked salmon into large flakes and stir into the quinoa mixture with the lemon zest and juice and harissa. Season and serve.